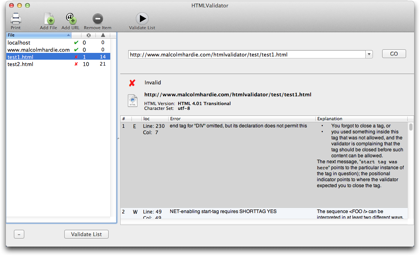 HTMLValidator is a Mac OS X app that validates the structure of web pages against the html standards. Making your webpages compliant with the standards means that your pages will work more reliably. Correctly written webpages are also a key step towards making your sites accessible for everyone. 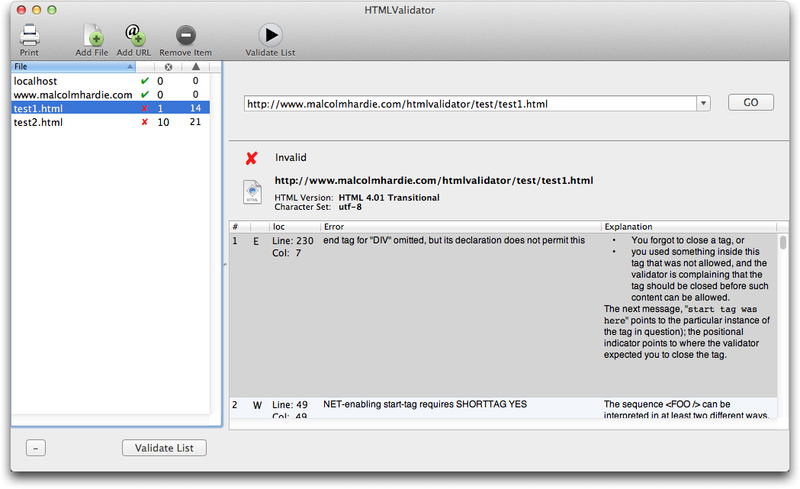 HTMLValidator makes validation simple, reliable and repeatable. And it works without connecting to the internet, which means your pages and content don't escape from your network (until you want them to, of course). The 1.2 release has been updated for 10.7/Lion. Users of HTMLValidator 1.2 are recommended to upgrade to version 1.2.3 which fixes a perl version issue and offers better update support. To do this please download the updated version listed (right). The current release cannot verify html5, instead a notice will be displayed warning you that it cannot be verified. We thought this to be better than trying to parse as something else and giving you incorrect warnings.